Enoteca Sociale offers precious little to be critical of as everything seems to be clicking here like the beads on Nonna's rosary during a prayer service. 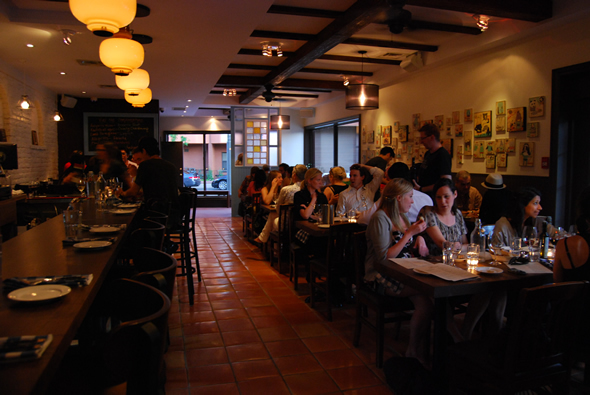 The proprietors have managed to pull off that most rare of atmospheres: a neighbourhood joint that you'll cross town for. I've mentioned before that sometimes the map is the territory. And you're in for a treat if you get your passport stamped at this humbly adorned embassy of rustic Italian dining brought to you by the Pizzeria Libretto gang because 'wine' and 'social' are pretty much Enoteca Sociale's coat of arms. Enoteca Sociale staff are thoughtful and informative without being pushy and what few awkward jitters there were upon being seated quickly give way to self-assured confidence. This crew, overseen by former Jacobs & Co. stalwart and Sociale co-owner Daniel Clarke, should be duly proud for completely debugging service so early in the resto's run and revealing a professionalism that long-established joints would envy. Meanwhile, at the back of the house, Rocco Agostino's card walks a fine Italian line while still managing to surprise at every turn. "I wanted to make simple food" smiles Agostino as he mentions that the card is composed of stuff he's always wanted to make along with several dishes poached from his Nonna and pulling the maximum amount of flavour out of the fewest ingredients. 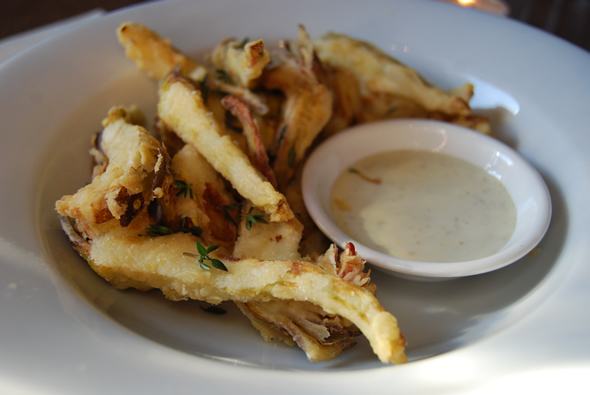 Antipasti arrive and we dive for the dish of savoury fritto misto artichoke fries flecked with fresh thyme ($8) faster than an Azzurri striker in the 8 yard box, crushing the dish in seconds. A wonderfully non-greasy order of veal sweetbreads topped by a tangle of peppery arugula in a lemon vinaigrette get wolfed as quickly as they appear all washed down with a fruity 2009 De Falco white ($10 a glass). 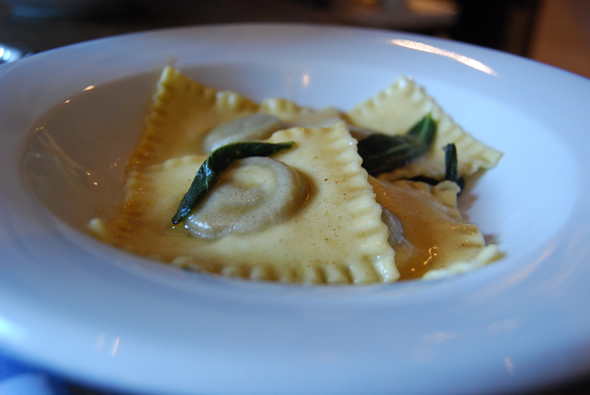 Thick ribbons of toothsome pappardelle dressed with generous amounts of braised rabbit in a delicate broth ($13, a family recipe dontcha know) or chubby ravioli anointed in saged brown butter sauce and stuffed with creamy duck liver ($13) are both stellar secondi. There're even kamut and gluten-free pasta options if that's yer bag. Mains of grilled Cornish game hen ($16) and braised Oxtail ($15) both trade in bold flavors. The summer-evoking palette of smoky grilled boneless bird supine atop a bright sauce of peppers, onions and caper berries screams sunshine, while the succulently moorish oxtail served on a bed of ultra-cheesy polenta paired with the 2001 Amarone ($24 a glass) would be the perfect treat on a cold winter night. A of lemony asparagus with shaved reggiano ($7) is the perfect compliment to either season. Plates are designed to encourage a proper 3 course Italian meal and are priced reasonably for the portions but definitely offer big flavours. And in another echo of the name, you can opt for eating 'family style' ($45 per person) from a separate 'tasting' menu. You'll even be able to share that big meal with your friends soon at a wine cellar table next to the cheese cave where they plan to age some of their own formaggi. Sommelier's Lesa LaPointe's CV includes stints at the Adelaide Terroni and Libretto so she knows a thing or two about pairing wines to Italian dishes. A selection of excellent vintages can be had. Prices begin at $35 per bottle, the majority are between $50 and $70 and the highest priced wine is $155. 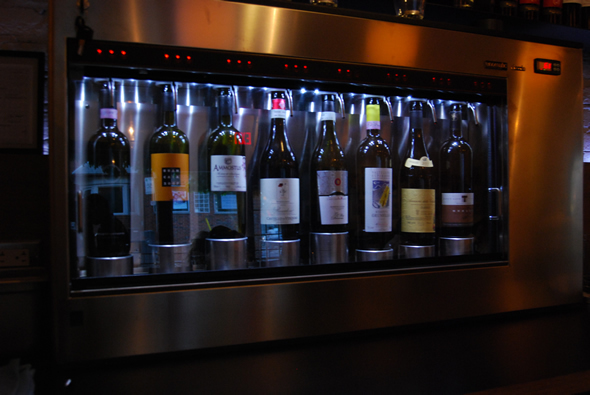 Employing the latest in wine science (the enomatic and vinfinity systems...you could call it eno- tech -a), also allows ES to offer a wide selection of wines by the glass that'd otherwise be prohibitively expensive. Desserts also amaze and every one was exceptionally well balanced adding enough sweet to finish off the meal while all were surprisingly light. Ricotta cheesecake and heavenly hazelnutty pastry cream filled zeppole floating in a bowl of creme anglais (both $8) FTW! 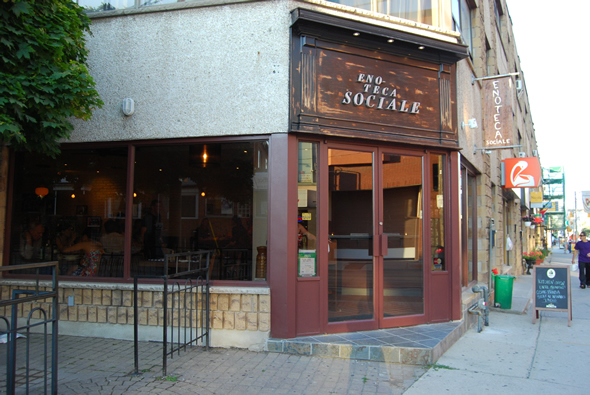 Enoteca Sociale is exactly what it says on the bottle and if you're looking for an Italian winner this post-World Cup season, look no further than the west end of Dundas west and start the parade to Enoteca Sociale's front door .